What is Latin? If you will look at the map of Italy on the opposite page, you will find near the middle of the peninsula and facing the west coast a district called Latium,1 and Rome its capital. 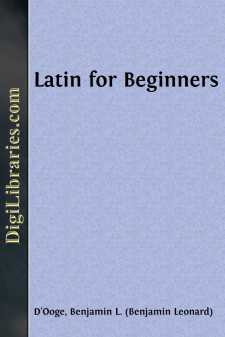 The Latin language, meaning the language of Latium, was spoken by the ancient Romans and other inhabitants of Latium, and Latin was the name applied to it after the armies of Rome had carried the knowledge of her language far beyond its original boundaries. As the English of to-day is not quite the same as that spoken two or three hundred years ago, so Latin was not always the same at all times, but changed more or less in the course of centuries. The sort of Latin you are going to learn was in use about two thousand years ago. And that period has been selected because the language was then at its best and the greatest works of Roman literature were being produced. This period, because of its supreme excellence, is called the Golden Age of Roman letters. The Spread of Latin. For some centuries after Rome was founded, the Romans were a feeble and insignificant people, their territory was limited to Latium, and their existence constantly threatened by warlike neighbors. But after the third century before Christ, Rome’s power grew rapidly. She conquered all Italy, then reached out for the lands across the sea and beyond the Alps, and finally ruled over the whole ancient world. The empire thus established lasted for more than four hundred years. The importance of Latin increased with the growth of Roman power, and what had been a dialect spoken by a single tribe became the universal language. Gradually the language changed somewhat, developing differently in different countries. In Italy it has become Italian, in Spain Spanish, and in France French. All these nations, therefore, are speaking a modernized form of Latin.